Megacities are growing so fast that it is becoming increasingly difficult for host nation governments to keep up with infrastructure and resource requirements. Drivers of instability are already present and in many places are growing by the day. It is inevitable that at some point the United States Army will be asked to operate in a megacity and currently the Army is ill-prepared to do so. The scale and connectedness of megacities lend gravity to events within them, which can quickly capture international attention and compel military commitment. Accurate predictions of where unrest will occur will likely continue to elude analysts in the future as it has in the past. Monitoring megacities, how-ever, may provide decision makers with effective predictors of looming instability with global impact. The problems found in megacities (explosive growth rates, vast and growing income disparity and a security environment that is increasingly attractive to the politically dispossessed) are landpower problems. Solutions, therefore, will require boots on the ground. 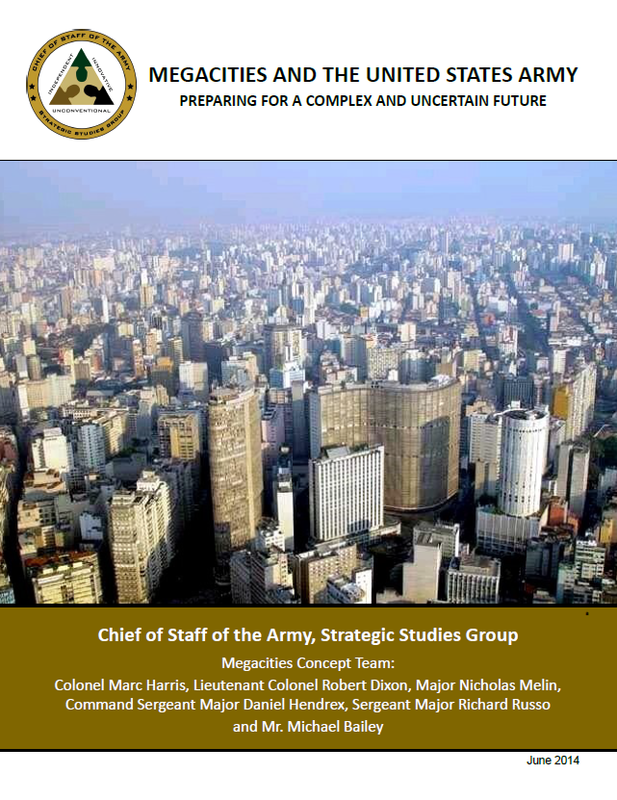 By increasing its appreciation of megacities, the U.S. Army can better understand how it might operate within them as part of a joint, interagency, intergovernmental, and multinational (JIIM) team. Leaders who appreciate the complexity of these environments will provide options to the National Command Authority that more closely match the objectives set forth in current and future National Security Strategies. The process of building understanding of each unique megacity will be neither quick nor easy. Only through a methodical, relentless approach to appreciating complexity will the Army of the future be able to meet the demands put upon it. This document is a first effort to explore the megacity challenge. The strategic significance of these places is explored, as well as the gap in both the Army’s and, more broadly, the Joint Community’s understanding of them. An approach for strategically appreciating megacities is offered, and case study vignettes from cities across the globe illustrate unique challenges posed by megacities. Finally, a series of first-order questions about the way forward are posed to provoke thought about how the Army might lead the effort to address the challenges posed by megacities. A megacity is not the only environment where a land force can be tasked to operate, but it is potentially the most challenging. Moreover, it is the locale where the Army’s contribution to landpower is uniquely relevant. This work, which can be reviewed fully in the Chief of Staff of the Army Strategic Studies Group Cohort II Final Report, comprises a first effort to appreciate the strategic significance of this environment and its implication to the Army. It is the assertion of this group that megacities are unavoidable, the Army must lead the national response , and the institution is currently unprepared. Megacities are Unavoidable. The accelerating migration of humanity to cities is undeniable. They are the centers of gravity for the human domain were drivers of instability converge. In a world made smaller by global connectedness, threats emanating from distant megacities will have the capability to threaten US interests, its allies and the homeland itself. If landpower is the tool to achieve strategic objectives in the human domain, then it will certainly be employed in this environment. The Army must Lead. The Army is entrusted with the Title 10 responsibility to prepare forces for sustained operations on land. It is the agent that must take responsibility for the Megacity challenge, build and empower a community of interest focused on these places, and formulate new strategic, operational and tactical approaches to large urban environments. The Army is currently Unprepared. Although the Army has a long history of urban fighting, it has never dealt with an environment so complex and beyond the scope of its resources. A decade of war in Iraq and Afghanistan has taught the Army that it must shape itself to the complex environments in which it is called to operate. This is the process that must begin now with megacities. As of now, megacities are blindspots from which a strategic surprise could emerge. It is plausible that the Army could be called to act in one of these places tomorrow. As their size and importance grows, it becomes probable. To succeed in each unique megacity, adaptability will not be enough. Now is the time for the Army to begin the process of understanding of these places and challenging itself across Doctrine, Organization, Training, Materiel, Leadership, Personnel and Facilities (DOTMLPF). Building a force for the future requires imagination and a willingness to make bold choices. It is the institution’s responsibility to prepare itself to provide the right tool to the Nation when contingencies arise.